Hello everyone, I am so excited to share with you this post . Welcome to Altenew Educators Blog Hop! As Altenew-Certificated Educators, we were asked to share our FAVORITE ( techniques, styles…. or Altenew supplies)! . And you all know who much I love altenew products. 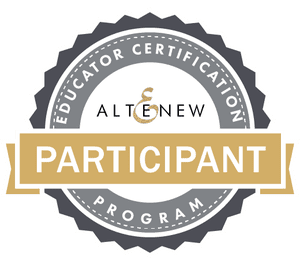 It was an honor to be part of this blog hop and to share with you some of my favorite stamps and products from altenew ..
Let me talk with you a little about my experance at Altenew Education certification Program or as we call it AECP . I was so lucky to be one of the earlier participants. There I found lots of amazing classes , that helped me to practice more in the cardmaking field. learning new techniques and mastering some old ones . For my personality _as i like this atmosphere of having a task and challenges was really attracting me _ so I found myelf in these clases . I was super lucky to be accepted in a level 2 . But after I finished it . I thought may be it was better for me to be accepted in a level one . So I have to create cards for the classes in the level one . Especially after I was amazed with my colleagues unique cards . They watch the class and they really come with a brilliant idea. I can’t talk about AECP without sending my deep thanks to our leader Virginia. She was always there next to me , her kind word and support will be always appreciated. My level two gradations ptoject encouraged me a lot you to start my youtube channal. And it was one of the thing that I wished to do many years ago . After that , i get brave and made my first altenew workshop teatching it was definitely not that easy to me , but it was something that I am so proud with it , and I encouraged to make by the course . After I finished , I am still have this passion to see the other participant cards in the AECP amazing gallary . It will never stopped amazing me with the unique design there , I am so proud of them , and I am more proud to see that they grow day after day . Especially when I see some of my crafty friends and talents joining this journey. For them I am waiting for your graduation. And to see more of your amazing creations. At our Altenew Educators supporting page we had a very nice close community that let us feel comfortable with each other and to be with our lovely and amazing leader Virginia . We growing with time and getting happy with the new members . There we get closer and to share our dreams , our future and our mistakes too. Let’s star my post ..
We asked to use our favorite from altenew .. so in this post I choose one of dies , stamps , mini stamps , stencils, techniques to create these card. choosing favorite from the favorites was so hard . Simpley because I consider most of altenew products are my favorites …. in my first card … i used One of my favorite altenew products is altenew fantasy floral 3d die se sience they released it and it became one of favorite die cut . For that I am going to share one of my best cards that I made for today post . This card I made with this die cut . In This card I only used a die cutting elements . First I die cut the altenew watercolor strips cover die with a black cardstock then I placed it over a white cardstock the die cut the flower with altenew fantasy floral 3d die se a on a watercolor paper . I used Altenew watercolor pan to color the flowers and the leaves to have this matching look I added extra red colors on the leaves and little of green and gold touch over the red bright flower , they are all matching the gold splattered background and the gold contracts that I die cut it from altenew altenew signature words die and I placed it over accete to have this exta dimension look. For the second card I used one of my favorite watercolor techniques.. for this watercolor Altenew watercolor pan i was waiting it for so long and I was excited to have the altenew inks colors in a watercolor pan. In this card I made one of my favorite coloring techniques it’s a glaxy type watercoloring or a starry night coloring. I used the blues and the black to create this background. I went inside the circle with lots of water then I let the pigment to deal with water to create this amazing background. To finish my card I stamped, watercolored and die cut with altenew ruffled flowers stamp and die bundle the matching die cut this image from the I placed over a vellum that I die cut with the same matched die cut . Placing them double sided foam tape to have more dimensions. I made two copies to give more dimensions and details to the card. For the last layer of these stamping image I embossed them with clear embossing powder to be more promenant . For the background I did some ink blending using Altenew sea shore inks pads . Then I added my favorite sentiment from one of my favorite stamping set altenew handpicked boutique stamp set . For my fourth card I used one of my favorite embossing powder its Altenew golden beach embossing powder . I like it with any type of card stock, acetate and the elegent vellum . For this card I made a very simple yet elegant card . I stamped the images from altenew ruffled flowers stamp and die bundle with clear ink over a vellum then I applied the over them and with heat embossing tool it melt leaving an amazing effect. I want yo add extra contrast so I made some blending over the vellum with Altenew tea party ink pads for the first time and I found it’s just perect. I found this card is so pretty and doesn’t want any extra details. Only I stamped the sentiment from Altenew celebration stamp .I placed it over a metalic white card stock . For my fifth card , I used one of my favorite stamping set altenew floral art stamp , and i was happy to see the logo for this hop having on it . So i couldn’t resist using them on my cards today . I did some watercoloring with Altenew watercolor pan I added extra effects on the background playing with the watercolor pan. I stamped the sentiment from the same stamp set .then I placed them over a gray card stock that match the gray in the background. For my sixth th card I used one of my favorite stencile Altenew mega rose stencil. I wanted to create a watercolor effect over it .. I blend many shades of yellow, pink , red , purple and greens altenew inks over the stencil with blending tool . Then I went over them with watercolor brush with adding more coloring in some areas over the blending area .. leave your card to dry then I added the sentiment from Altnew circular sentinels .. you will have an amazing results at the end ..
For my seventh card , i made a little small card using one of my favorite mini stamp from altenew altenew little one stamp die bundle , I stamped the small image over a background with gray ink then I did some blending for the background with . Then I die cut baby with altenew fine alphabet dies over a white glitter foam . I place the baby onesie and I die cute with the matched die cut . I stamped these dots with gray using the dots in the same stamp set . I added a little bow from the matching die cut . over the Y . It’s kind of cute and give a girlly touch . For my last creation this super fast tag I used on it one of first and still my favorite Altenew Vintage flower becouse all the memoris that I had with it. I like to stamp this flower partially at one edge of the tags . And a simple two leaves on the side . It’s super fast and creat pretty card in a 2 minutes. You can hope a long follow the order below to see lots of amazing creations . If you would like to go for the next amazing designer and card maker which is Amber’s blog at Notable Ink . 1. ..Altenew is giving away $30 Gift Certificate to THREE lucky winners! Please leave a comment on the Altenew Card Blog by Jan. 23rd for a chance to win. Three winners will be announced on the Altenew blogs on 1/25/2019. Altenew is also gonrasly sponsoring a $15 gift certificate on my blog. Simply comment on this post to be elligable . The winner will be announced in a different post on on my blog by 1/22/2019 . I hope you all have a happy week end . Gorgeous cards. You’ve given my a lot of inspiration. Congrats on becoming an AN Educator Maryam ! Love all your cards, as always you did an outstanding job showcasing AN´s products!Thanks for the inspiration! I am blown away at the elegance and beauty of your cards, as well as with the quantity of the cards you made! They are all so different, yet beautiful! I will definitely be following your blog! I especially want to create the starry night background, and sharpening my skills on watercolor! Thanks for the inspiration and for the opportunity to win! Congratulations on becoming an Altenew Educator! Best of luck! Beautiful cards! Love the backgrounds. Thanks for sharing! Gorgeous cards! Congratulations on becoming a educator. love the cards their just stunning .. These are all so incredibly beautiful!!! The work and expertise that has gone each is so beautiful! What a great example of the creativity that comes from these wonderful lessons from Altenew’s program. judging by your beautiful creations, Educator is well-earned!! Congrats on being an Altenew educator! Beautiful projects, I love them all, especially the lovely soft pink card with flowers spilling from the top! Love your cards, so gorgeous and your color techniques are awesome. Subbed to your youtube as well. Your flowers are all so gorgeous! Love all your cards!